The Singles Collection: Australia; EMI, 828 1004; 1993. Double album released as two separate cassettes. Eight panel cover on glossy, folded paper with perforated spine. Full panel cover photo; inner picture panels and lyric panels. Inside lyric panels and final photo panel with track list on. Blue spine and rear panel with track list on. ‘1’ on spine not in circle. White ink printed directly to clear shell; plain slip sheet. ‘Dolby HX Pro’ and ‘XDR’ logos. XDR was a process developed by Capitol Records to provide higher quality audio and is the American branding of their original Canadian SDR (Super Dynamic Range) released in 1982. 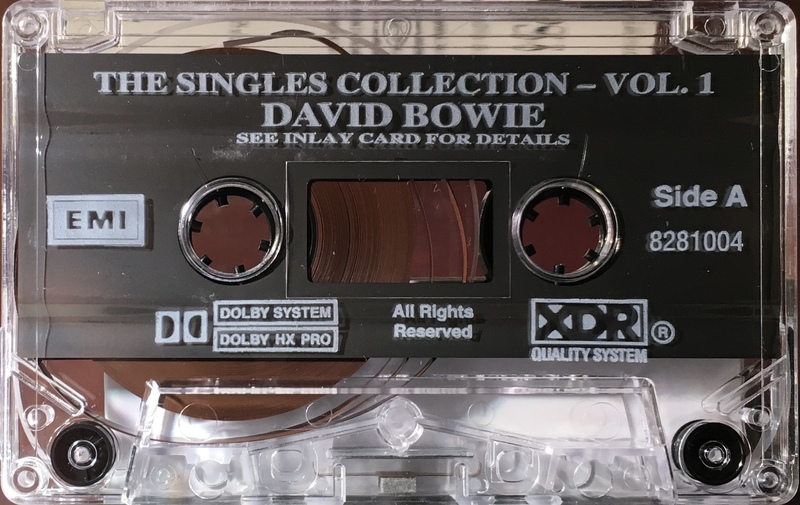 Side 1: Space Oddity; Changes; Starman; Ziggy Stardust; Starman; Ziggy Stardust; Suffragette City; John I’m Only Dancing; The Jean Genie; Drive-in Saturday; Life On Mars? ; Sorrow. 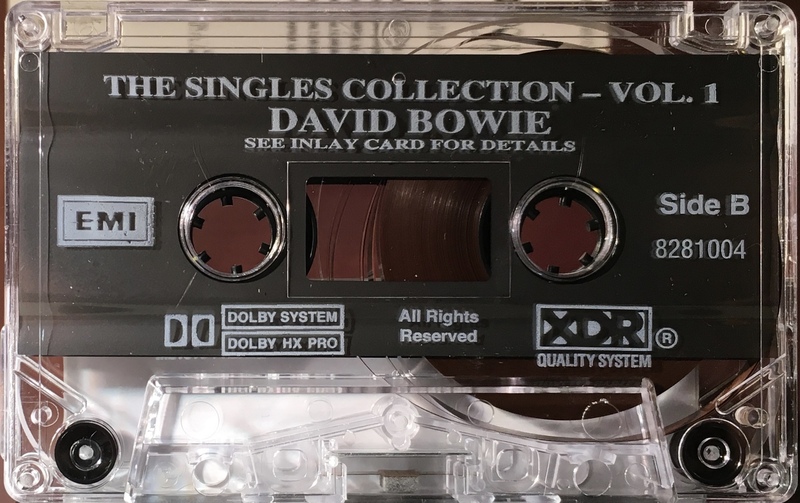 Side 2: Rebel Rebel; Rock & Roll Suicide; Diamond Dogs; Knock On Wood; Young Americans; Fame; Golden Years; TVC 15; Sound & Vision. The Singles Collection: Australia; EMI, 828 1014; 1993. Double album released as two separate cassettes. Eight panel cover on glossy, folded paper with perforated spine. Full panel cover photo with unique green tinge; inner picture panels and lyric panels. Inside lyric panels and final photo panel with track list on. Blue spine and rear panel with track list on. ‘2’ on spine not in circle. 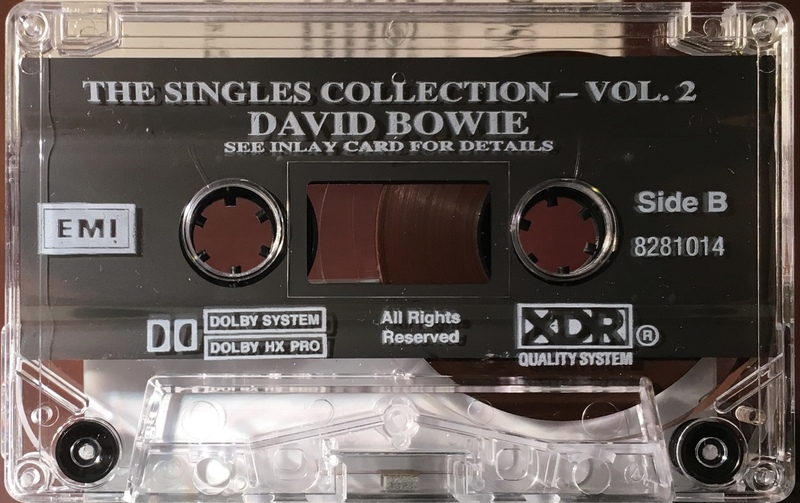 Side 1: Heroes; Beauty & The Beast; Boys Keep Swinging; DJ; Alabama Song; Ashes To Ashes; Fashion; Scary Monsters (and super creeps); Under Pressure. 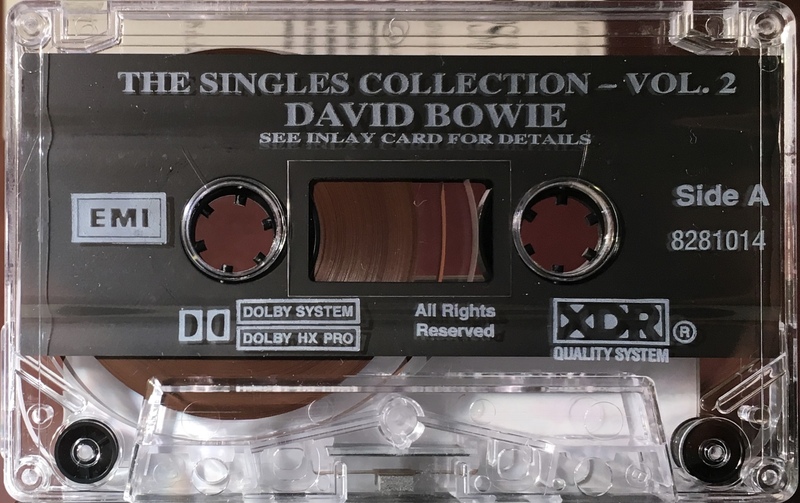 Side 2: Wild Is The Wind; Let’s Dance; China Girl; Modern Love; Blue Jean; This Is Not America; Dancing In The Street; Absolute Beginners; Day-In Day-Out.